HOLA received an e-mail stating that out of 29 nations and/or companies, the New York-based World View Productions earned third place (after Belgium and Mexico) in the Nuevo León Theater Festival in Monterrey, Nuevo León, Mexico with their production of Cayendo con Victoriano. The show, also a recipient of a 2011 HOLA Award, was written by Luis Enrique G. Ortiz Monasterio and directed by Luis Martín. The play features Alfredo Huereca, Ana Verónica Muñoz, Raoul Bretón, Bill Blechingberg and Mío Marabotto in the cast and took place at the San Pedro Theater. You can see a photo of the company at their curtain call above, at right. Repertorio Español is presenting Tres obras cortas del Siglo de Oro. The three short plays from Spain's Golden Age are from famed playwrights Félix Lope de Vega, Miguel De Cervantes Saavedra and Pedro Calderón de la Barca and are directed by Andrés Zambrano, a Van Lier Directing Fellow. The production will have an August and September run at Repertorio Español's namesake theater in the Rose Hill section of Manhattan. 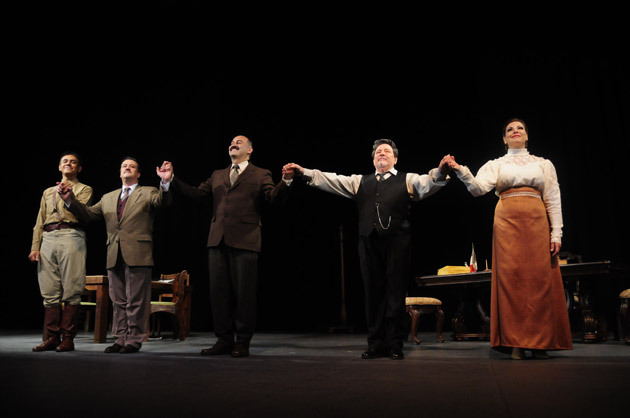 The cast includes Mariana Buoninconti, Inés García, Gerardo Gudiño, Alicia Lobo, Mario Mattei, Julián Mesri, Daniel Ojeda Astigarraga, Alex Pita and Alfredo Tauste. TeatroStageFest and La Criatura Theater are presenting The Orphans. Written and directed by Karina Casiano (based on an original idea by Karina Casiano and Jorge Dieppa), the two-hander is performed by Renzo Ampuero and Karina Casiano with stage management by Edna Lee Figueroa. Originally produced in association with La MaMa E.T.C., this production (called Os Órfãos in Portuguese) is being presented by Social Service of Commerce (Serviço Social do Comércio, or SESC), at the SESC Belenzinho Theater, located in the Belenzinho district of São Paulo, São Paulo, Brazil. Teatro LATEA and the Hudson Exploited Theater Company (HExTC) are presenting a special presentation of Adrian Rodríguez's play Mo(u)rning. Presented in commemoration of the tenth anniversary of 9/11, the presentation will take place on Saturday, September 10, 2011 and Sunday, September 11, 2011 at Teatro LATEA's eponymous theater located in the Clemente Soto Vélez Cultural and Educational Center (home to HOLA) in Manhattan's Loísaida neighborhood. The play is directed by Arian Blanco and feature Liche Ariza, Gregg Bellón, Ileana Canal, Howard Collado, Loren Escandón, Omar Hernández, A.B. Lugo and Jim Thalman in the cast.